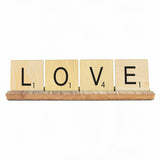 Use game tile coasters to spell out words, names or anything that is special to you! 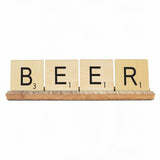 Buy a single letter tile for family members, spell out READ or BOOK for your book club, or pair a set of WINE or BEER coasters with a bottle of wine or a growler for a wonderful holiday gift! Coasters come in a bamboo box, free with every 4 coasters you buy. But, you can also display the coasters on a shelf or mantle using our bamboo display Line 'em up to make them accessible and to enjoy the art display. 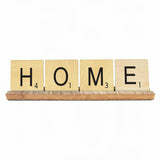 You can purchase one of the Scrabble Coaster Sets or build your own set. 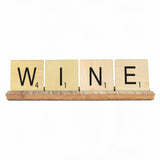 You can buy single coaster or as many as you'd like. With every 4 coasters, you will receive a bamboo display box at no extra cost. So with 4 coasters, you get a box, with 8 coasters you get 2 boxes. If you buy less than 4, we will carefully package those up for you too, not to worry.